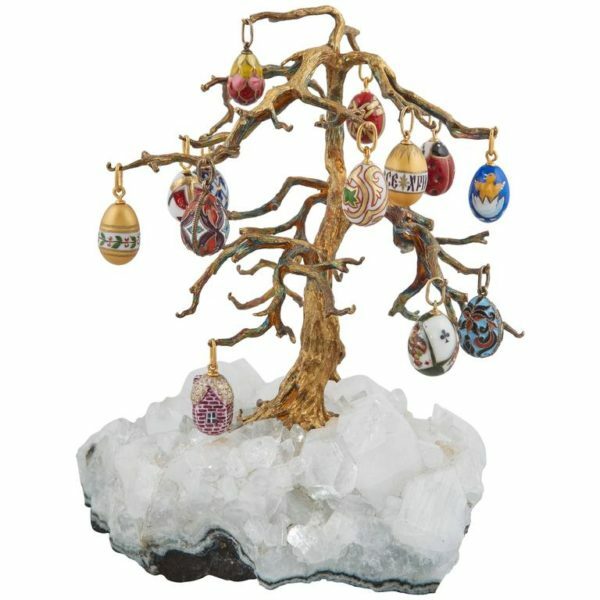 A custom made rock crystal gilded tree suspending thirteen Russian egg pendants from St. Petersburg or Moscow. Motifs include a dacha, a deck of playing cards, a hatched chick and Russian Orthodox Churches. A unique selection of hand-painted porcelain and enamelled silver miniature eggs, each may be detached from the tree and worn as a pendant on a chain. H – 6 in. (15 cm), Tree including base. Base is about 2 in. High (5 cm). Base and tree is about 5 1/2 in. (14 cm) X 5 1/2 in. (14 cm).